Here’s one way YOU can increase your online exposure! 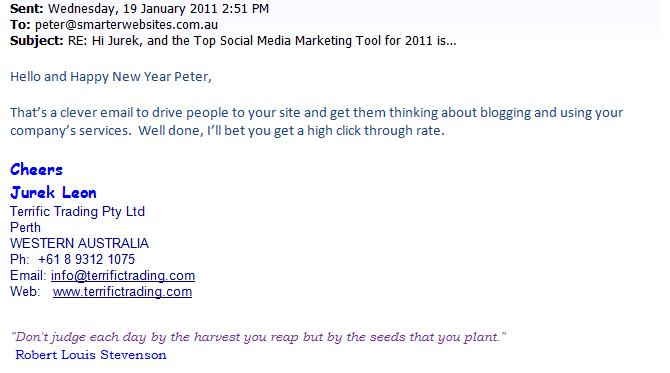 I had 3 direct email responses to that post which was great, love feedback, always good for the ego. 2 are shown below, 1 guy wants to remain anonymous. But for those into leveraging results here’s an even smarter way to go. Reap the benefit, take time to make a comment yourself at the bottom of post’s. You get online exposure, you get a link back to your website and everyone’s a winner threefold. So if Jurek and Andrew had made a comment on my website then I love that, the world gets to see interaction on my site and they will pick up a back link plus maybe some traffic to their own site. Who wants more website traffic? So Andrew and Jurek, it’s not too late. (Late Notice – Andrew did make a comment in my little “shout box” on the home page of my site). Another interaction tool I use. You might as well make a comment. You’ve taken the time to read it so you may as well as get another benefit apart from the content. So, You! Make a comment NOW! If not, go get a Gravatar ! Go make a comment NOW! It’s not hard, right now, right below!